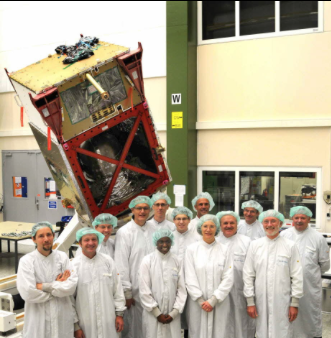 [SatNews] After six months of intensive testing, the first Sentinel-2 satellite developed and built by Airbus Defence and Space for the European Space Agency (ESA) is getting ready for its mission in space. Sentinel-2 is the two-satellite, optical mission segment of the GMES (Global Monitoring for Environment and Security) programme, an initiative of ESA and the European Commission. Sentinel-2A will be the second satellite of the Copernicus program to be launched. Copernicus is an operational program led by the European Commission (EC) in partnership with the European Space Agency (ESA). The Copernicus Sentinels supply remote sensing data of the Earth to deliver key operational services related to environment and security. “Sentinel 2 is the next important milestone to deploy Europe´s Copernicus program for which Airbus Defence and Space is a key contributor. In particular, we are prime contractor for five of the seven Sentinel missions, and have built state of the art instruments and components for the others, such as the radar of Sentinel-1A that is working perfectly in orbit,” said François Auque, Head of Space Systems. In IABG’s facilities in Ottobrunn (near Munich, Germany) Airbus Defence and Space engineers put Sentinel-2A through a rigorous test campaign that included acoustic testing to simulate the huge noise generated at launch, vibration and separation shock testing to simulate mechanical launch loads, and thermal vacuum testing to simulate the environment in space. The 1.1 tonne satellite is now scheduled to be shipped to the European spaceport in Kourou, French Guiana, in April. The S2A launch by VEGA is scheduled in June. Sentinel-2A will deliver optical images from the visible to short-wave infrared range of the electromagnetic spectrum from an altitude of 786 kilometers using 13 spectral bands with a resolution of 10, 20 or 60 meters and a swath width of 290 km. This combination is unprecedented in the category optical imagers. The data will be used for studying land use, soil sealing, land management, agriculture, forestry, natural disasters (floods, forest fires, landslides, erosion) and to assist humanitarian aid missions. Environmental observation in coastal areas likewise forms part of these activities, as does glacier, ice and snow monitoring. Sentinel-2B, which is identical in design, is planned for launch mid-2016. These two satellites orbiting the earth every 100 minutes will be able to capture images of our planet’s entire land surface in less than five days.